Manage your grazing block well to maximise your silage area. Irish Grassland Association event will focus on Grazing Infrastructure. 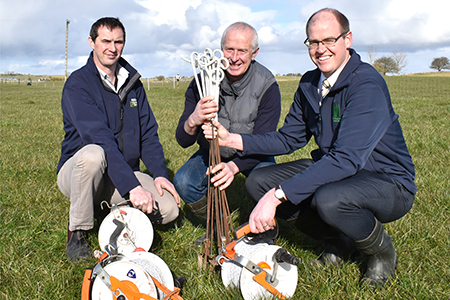 Towards the end of 2017 the Irish Grassland Association completed a short member survey asking what events they would most like to see for the coming year, following the feedback received it was decided to run an event focused on grazing infrastructure. The event will focus on grazing infrastructure to improve grass utilisation. It will be held on Wednesday 25th April on the farm of Billy Gilmore, Tuam, Co. Galway, commencing at 10.30 am sharp. The event will be free for anyone interested in attending. 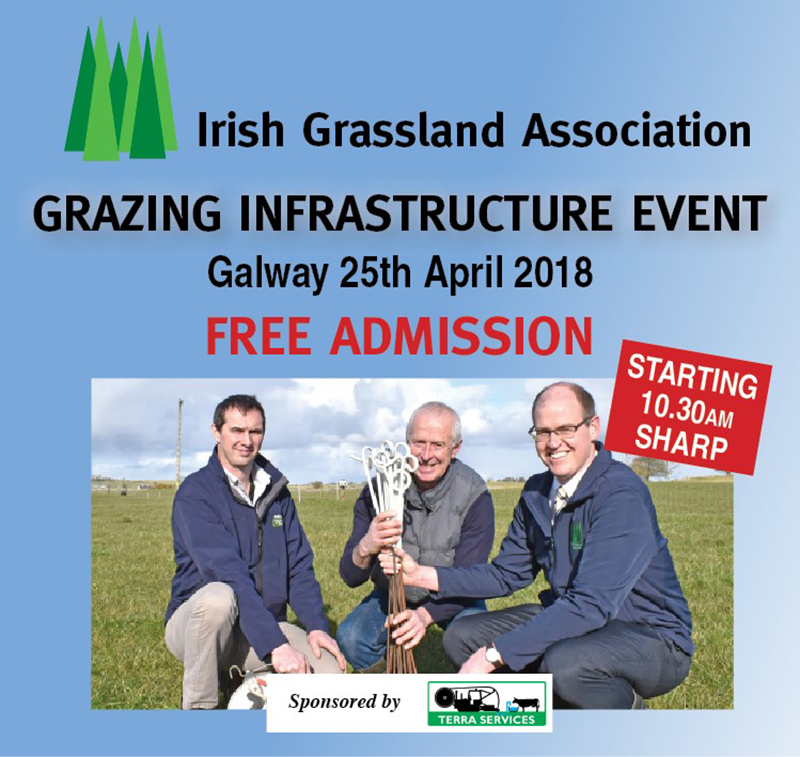 The objective of this event is to demonstrate options and costings for improving grazing infrastructure on your farm and will focus on water, fencing, paddock layouts and roadways with the ultimate goal of achieving higher grass DM production and improved utilisation of grass. The event is being kindly sponsored by Terra Services. Billy Gilmore is a well-known former participant in the BETTER Beef Farm program. Billy and his son Martin farm in partnership in Cortoon, just 10 km outside Tuam in Co. Galway. Billy farms just over 55 hectares which is fragmented into 10 parcels. It comprises of owned and rented lands which are relatively dry, however approximately 20 ha could be described as heavy and liable to some flooding in winter/spring. In the past 2 years the farm has changed from suckler cows and selling weanlings to contract rearing heifers for a local dairy farmer and the Newford herd in Athenry. In 2018 there will be 116 yearlings reared with another 26-30 coming in May. Billy also has a sheep enterprise, lambing 160 ewes this spring. The farm stocking rate has increased considerably since 2009, from 1.2 LU/ha to approximately 2 LU/ha at present. Since 2009, gross output has increased from €789/ha to €1425/ha with a corresponding increase in gross margin from €538 /ha to €1395 /ha. Billy has focussed on a low-cost grass-based system in order to keep variable costs low. Some of the changes Billy has implemented on his farm to achieve this improved performance include, weekly farm walks, optimum pre-grazing yields and grazing to a residual of 3.5 cm resulting in more high-quality grass in the diet and better utilisation of this grass. Ultimately, he has achieved this by splitting large fields into paddocks with better placement of water troughs allowing for easier grazing management and better control of grass on the farm. The paddock system allows easier management of the stock on the farm. At the event, Billy will discuss the decisions he made regarding paddock size and fencing options. Through improving the infrastructure on his farm and the associated increase in grass production and stocking rate, Billy has been able to reduce the amount of land he rents. Leading experts will give advice on a range of topics relevant to the infrastructure of the farm which will result in improved grass utilisation. An important aspect of the event will be highlight the various options available regarding water, roadways, fencing and paddock layouts and a breakdown of the various cost options associated with each of these. There will be something for everyone at this event. 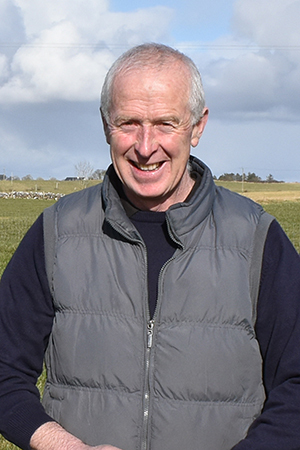 Introduction and Farm Background: Host farmer, Billy Gilmore and his Teagasc Advisor Gabriel Trayers will outline the history of the farm including grass production and utilisation, farm layout and soil fertility profile. Animal performance targets will also be discussed. Infrastructure considerations: Catherine Egan from Teagasc will describe good practice guidelines and options and financial costings for improving grazing infrastructure including water, fencing, paddock layouts, roadways etc. Host farmer, Billy Gilmore will also describe decisions he made relating to the farm infrastructure including, the options available to him and the reasons for his decisions as well as describing how the system works for his farm. There are several low-cost options to improve farm infrastructure and increase grass utilisation and these will be the key focus of this discussion. Bridget Lynch from UCD will discuss summer grassland management to maximise grass utilisation. Topics discussed will include ideal grazing covers, grass allocation, and target rotation lengths to achieve performance targets for various animal groups. The event will start at 10.30 am sharp. The farm is located North-East of Tuam and will be well signposted off the N83. This is a free event for all are welcome to attend. Please contact the Irish Grassland Association for further details or keep up to date with our website www.irishgrassland.com, facebook or twitter for more details of this and all our events.